Seven years ago, I had a short residency at VCCA-France (The Virginia Center for Creative Arts—Moulin-à-nef) in Auvillar, France. Because I didn’t want to arrive jet-lagged, I flew into Toulouse and stayed there for nearly a week before my residency in order to get accustomed to the time and also to see a part of France I hadn’t visited (i.e., anywhere other than Paris). Getting to Auvillar involved a train ride of about an hour-and-a-half. When my residency was over, I took the train back to Toulouse and flew home from there. I’m headed back to Auvillar for another residency and decided to check out a different city before I get to work. This time I flew into Paris (because I plan a short visit there at the end of my stay in the country) and took the train from Paris to Bordeaux, a city I selected because it’s relatively close to Auvillar (about an hour by train), but also because I’m a red-wine drinker and love the full-bodied wines of the region. Hopping right on the train after a trans-Atlantic flight made sense to me because the day of arrival in Europe is often wasted. Your flight arrives in the morning, too early to check in to the hotel, so you sit in a café for a few hours waiting (or stumble through the streets as I did the last time I visited Paris) and then are probably too tired to do anything once you get your room. Although I was a little worried about making the connection to the high-speed train I had booked (the TGV), I got to the terminal at Charles de Gaulle airport with lots of time to spare. 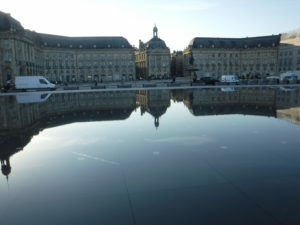 The train ride was wonderful, and we made it to Bordeaux in mid-afternoon, on schedule. I was awake enough to use a public bus to get the B&B where I was to stay, and had no trouble finding the place and getting into my room. A bit about the room: Villa Erizio. It’s wonderful. I booked it through Expedia because of the way it was described, but it’s even better than I thought. It’s an old building that’s been beautifully restored and decorated, with windows overlooking a quiet side street. It appears to have 5 rooms of varying sizes, with full kitchens, free wifi, and breakfast pastries delivered every morning. I wouldn’t mind going out to a café, but this has been wonderful. And there’s a market around the corner where I’ve bought fixings for most other meals. The apartment isn’t cheap, but I think it’s a good value. And I love Bordeaux. The weather has been great—sunny, with daytime highs in the mid-60s—which has been perfect for my favorite pastime, walking. The city sprawls along the bank of the Garonne River, and the quai is extremely pedestrian friendly. Plus, the busses and the tram (I especially love the tram) are easy to use when you just can’t walk anymore. Historic sites are plentiful, as are restaurants and cafes and shops. The two highlights of the trip both involve wine. First, through Bordovino.com (although I again booked this through Expedia), I took a small-group tour (conducted in English) to the Medoc region of Bordeaux. 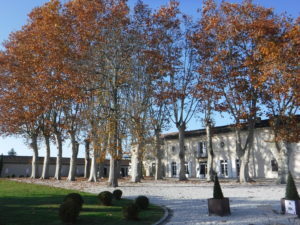 The drive up there was beautiful and we visited two Chateaux for tastings and tours and stopped by Chateau Margaux just to see it, as it is one of the most famous wineries in the world. Our tour guide was Rémi, who was charming and knowledgeable. (Because I sat in the front seat of the mini-van, I got to chat with Rémi quite a bit and learned that he also spent some time in Asia, having worked in Indonesia in the hospitality business.) The trip was both fun and informative. I visited the Musée d’Aquitaine, which covers the long history of settlements in the area. I especially liked a temporary exhibit about Jack London’s voyage on his sailboat the Snark (here, I suppose, because it took him to French Polynesia) as well as an exhibit about Michel Montaigne, the essayist who also happened to be mayor of Bordeaux, 1581-85. As a fan of art museums, I felt obligated to visit the Musée des Beaux Arts, but it was something of a disappointment. It consists of two smallish main wings for its permanent collection, plus a gallery across the street for temporary exhibits. There were a few gems in the section of the collection devoted to impressionism by artists I’d not heard of. 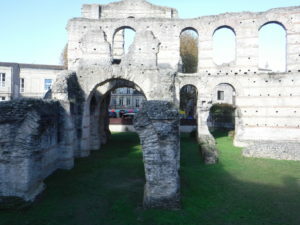 I liked the Palais Gallien, ruins that date from the 2nd No doubt there are lots of ruins underneath what has become a densely built city. In another area, there is a display about a discovery made when an underground carpark was being built. Probably you can’t dig a hole anywhere in the city without finding something. I followed the UNESCO Heritage Trail, which includes a variety of structures built over the last 600 years or so that also takes one through a lot of interesting neighborhoods. 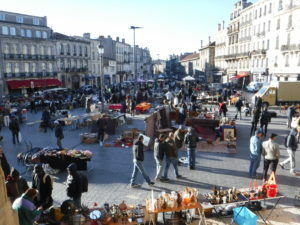 I visited various markets—with fruits and vegetables and fish and cheese and bread, etc.—and a huge outdoor flea market. Because I’m about to immerse myself in a writing project, I also checked out some of the many bookstores in the city, including the most famous, Mollat. 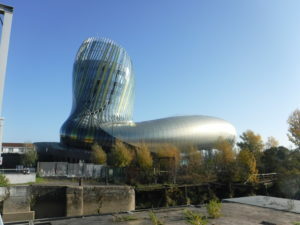 I’ve brought more than enough with me to read, so I didn’t buy anything there, but I did find an interesting article about Literary Bordeaux that focuses on that store: Literary Tourist in Bordeaux, France. And now my time in Bordeaux is coming to an end. On Monday, I’ll board a train to the east where I’ll set myself up in Auvillar and, I hope and expect, get back to work on my new novel. I’ve loved my time in this city, though, and recommend a visit. Thanks for including me in this post. Sitting here at Hershey Tire in Staunton and dreaming of France! It’s wonderful to live vicariously through you right now!